Immaculate. Modern. Fantastic Location. Amazing Views. Excellent Value! Location! Location! Location! Enjoy a 5-Star property in the heart of Vancouver. This 700 sq ft luxury condo is fully equipped for your longer term executive accommodation or extended vacation. Tastefully decorated with high-end furnishings and all the trappings of a luxury hotel. Walking distance to Everything! Shopping, Entertainment, Dining, and Public Transit. And let's not forget the Spectacular Mountain and Ocean Views! Enjoy the excellent service of an experienced and hospitable landlord. Secured parking and wifi is INCLUDED! This is a spacious one-bedroom condo, with a queen bed. Rates are based on two guests. Our friends and family love coming to stay here. The location is perfect, and when you compare the price to Vancouver hotels (or other Home Away properties), the Spectrum is the perfect choice. Wonderful location, extremely well stocked with everything you would need. The owner was fabulous to work with ! The apartment has wonderful views. We could watch the cruise ships come and go. It was nice to have a patio to enjoy the views. Great place and hope we can come back! Great location next to sky-train. Gerry was very helpful above and beyond what would be expected. Condo was as advertised. Nearest grocery store a couple of blocks away so we didn't need a car. Would stay there again. 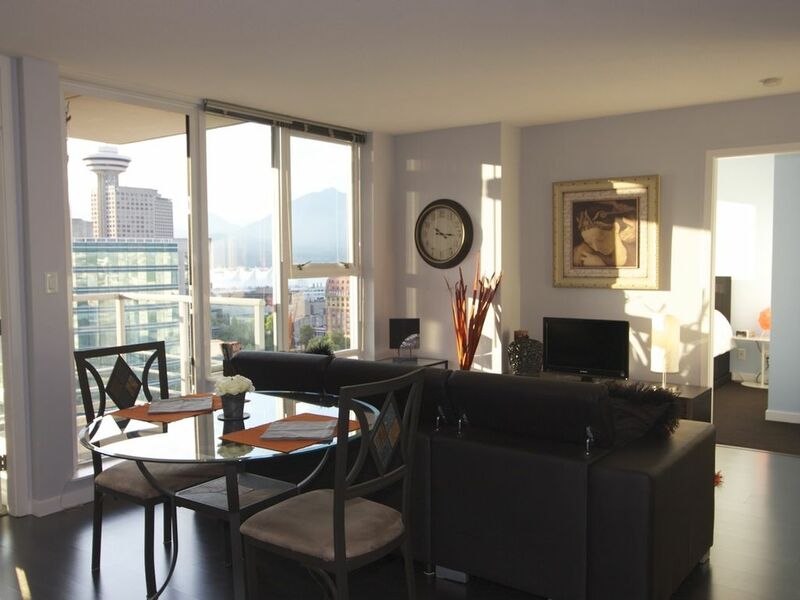 This condo is wonderfully located for every imaginable activity in Vancouver and has fabulous city and mountain views (from the 22nd floor of this building). The owners have appointed it very nicely and stocked it with everything a visitor could possibly want, from bottled and Brita water to Keurig and French press coffee makers, an electric kettle, lots of cutlery, tons of new towels, etc. They also provide basic provisions (tea, coffee, water, detergents, cleaning materials....). The bed is comfortable, as are all the furnishings. And, in a building around the corner there are adequate gym facilities and a nice pool. Lots of great restaurants are within easy walking distance. Costco is literally around the corner. The T&T supermarket, which has a delightfully Asian flair, is a five minute walk away, as is a wine and liquor store. Nearby coffee houses abound. The Skytrain station is just across the street. In short, everything is highly convenient. As an aside, I might mention that Vancouver drinking water from the tap is some of the best in the world. Bring your refillable bottle. The owner, Gerry, was immediately responsive to all our queries, both before and during the stay. Our only dissatisfactions result from issues the owners can't really address. There for two weeks (nearly), during half of our stay one of the two elevators in the building was out of service. So, waits were fairly long. Taking the trash and recycling down to the basement is a small challenge, as well. Also, at least two of the windows in the condo cannot be fully closed. So, there is a good deal of noise from the street. If you are a light or late sleeper, I would seriously recommend ear plugs and a sleep mask. A very tired and poorly maintained building, beginning with the entrance/lobby--torn furniture, tattered rug, not clean and one elevator was not working for most of the two weeks we were there. We were very impressed with the building's garbage/recycling area---very clean and well organized and very eco-friendly. The unit itself, was very tired and needed a deep clean in all areas. Whoever does the owner-Gerry's-- cleaning-- does not serve him well at all. We will be letting him know exactly what we were unhappy about but suffice it to say that the place needs a great deal of attention. I spent a lot of time cleaning the place, before settling in and I don't expect to have to do that when one rents a condo through VRBO, especially at this price. It was well equipped with just about anything one might need--eg., towels, dish cloths, kitchen appliances, cleaning supplies and it was great to have a washer and dryer. More dinner plates are needed in the kitchen and a sharp knives for cutting meat. The ones supplied are quite dull. The bed was comfortable but new pillows and pillow covers are needed. The storage closet was so full of junk that we could not use it for putting our suitcases in. The same goes for the cupboard under the bathroom sink. We would recommend a new broom--a small, hand held vacuum as the large one he had was full and very heavy so that I could not use it. The shower head did not stay in place and the tub tap kept falling off. Needs attention. There is no stopper in the bathroom sink. With a deep, spring clean and attention to more detail fixes this condo could be a five star, as the location and view are spectacular. We were quite disappointed to find that the condition of this condo did not meet our standards and our expectations given what we read on VRBO before renting this space. We also encourage Gerry to install handrails outside the bathtub and in the tub as it is very dangerous to get in and out of the tub, being older and somewhat mobility challenged. It is a challenging process and someone may fall at some point. We appreciated Gerry finding us another parking space in the building when we had to move our rental for the garage cleaning. He has organized a well set out arrival and exit process which was appreciated. Once we cleaned the unit and organized our things to our satisfaction with the limited storage available, we enjoyed our experience and all Vancouver has to offer. I am sorry to hear of this guest's impression of my home. I am an owner who takes great pride in ensuring guests are cared for (as indicated in practically every other review). Cleaners do miss things from time to time, but it is unfortunate this guest did not notify me of her dissatisfaction until days after her departure. I can assure you that on the rare occasion an issue does come forward, my response time is immediate. I only wish I would have been offered an opportunity to right any supposed wrong. - The storage closet the guest is referring to is typically not available to guests (and stays locked). This is where we keep additional supplies and seasonal items. The condo does however have two other closets, a den and large-sized drawers in the bedroom that guests have full access to. - my so-called "tired condo" has been repainted, has new floors and a new couch within the last year. All sheets and linens are replaced every 6 months (whether they need replacing or not). - Thank you for your comment on needing a sharp knife, pillows and a stopper for the bathroom sink. That has been remedied. My husband and I spent March at Gerry's condo. He was very professional and quick to respond to our questions. The location is perfect if you want to be right downtown. We enjoyed having a 25m pool and gym to use on the rainy days. Our bikes were safe in a bike storage and the bike paths were available right outside the door. Only con is that with being right downtown it can be noisy with sirens at all hours. IDEAL Location - Spacious, bright apartment downtown! Gerry's apartment is in the perfect location. You can walk or transit anywhere in the city. The floor to ceiling windows are gorgeous - you can see the city, mountains, and water. The apartment has everything you need to live comfortably. Gerry is an excellent host. He responds almost instantly to any questions or concerns. I highly recommend staying here if you are visiting the Vancouver! Steps away from all major sport and entertainment venues (BC Place, Rogers Arena, QE Theatre, The Centre for Performing Arts, Vogue, Orpheum & Van Library. Historic Gastown is 5 a minute walk to the north and trendy Yaletown is a 7 minute walk to the south. Location! Location! Location! - We take pride in keeping our residence to the very highest standard. As such, smoking or pets are NOT permitted in the suite or patio.